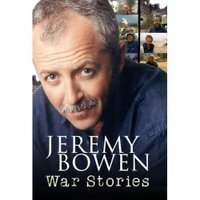 To Marylebone this evening for the launch of fellow Cardiffian Jeremy Bowen's new book. But wait. Spot the deliberate mistake on the front cover. In the public's imagination Jeremy will forever be associated with the hairy caterpillar nestling on his top lip but our venerable Middle East Editor shaved off his trademark 'tache several years ago. I can exclusively reveal that the cover photo was in fact taken in 1999, when we were all a lot younger.